cost, location, and age restrictions to name a few. Although the Levitt AMP grant only promised 10 concerts over the course of the summer, John along with partnering organization the Galva Arts Council, knew this would have to become an annual concert series to make a lasting impact. 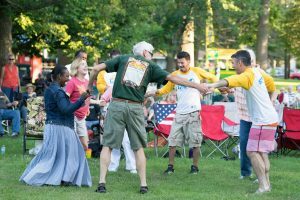 The concert series would require new relationships, rekindling relationships, and deepening community connections in order to be successful in both the short and long term. 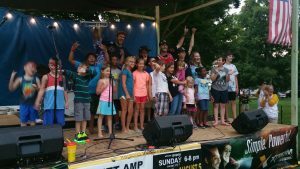 To be considered for the Levitt AMP grant, a qualifying community must first show community support through public voting and then raise matching funds, both of which seemed very challenging in the initial year, especially with Galva being the second smallest city competing for the grant. Although this seemed daunting, both the voting and fundraising efforts proved to be valuable for engaging the community. One of the first connections made was with the Galesburg Community Foundation, which awarded the Galva Arts Council with a grant in the initial year. Although the Galva Arts Council had a history of working with Galesburg Community Foundation it had been several years since they had actively partnered on a project. The concert series renewed this relationship, which has carried over into the second year, and with insight and advice from Galesburg Community Foundation long term plans are being made. 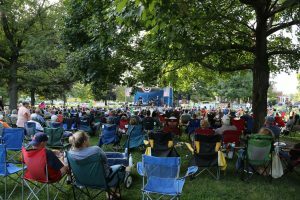 The first year of the concert series brought live music to over 7,000 people, bringing many to Galva for the first time. The entire effort was put on by volunteers, nearly 75 of them, and engaged the community to come together for a common cause. Many of the relationships started as a result of this concert series have sparked other community-led projects. Going into the second year, it is anticipated the concerts will have an even greater impact, helping solidify the prospect of making this an annual event and growing over time.